1. Navigator have sent us some more details of their resin 1:35 Mil Mi-24V Hind-D.
"Model length is about 500 mm, rotor diameter is 610 mm. The model is nicely detailed, especially the interior and the wheel wells. The kit contains two versions of undercarriage strut legs (retracted and not), 3 figures - pilot, operator and 'crew chief'. The weapons set includes two external fuel tanks and 8 anti-armour missiles 9M114. Exhaust IRSS shrouds are also included. The Czech "4+ Publication" was used during the creation of the master model, but that was not enough. Navigator's staff have also visited some airbases for detailing measurement of the prototypes. Other modifications of the Mi-24 will be released soon. Also in progress is an "Afghani" version of the Mi-8." I assume this last bit refers to a new version of their previously released 1:48 Mi-8. It still isn't clear whether transparent window parts are included in the Hind kit - we're waiting for an answer on this point. 2. 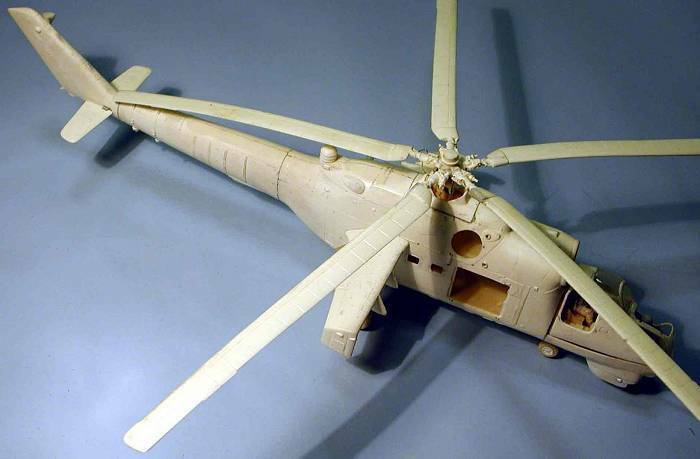 Here's a HKN reader's in-box review of the 1:48 Fonderie Miniatures Sikorsky HO3S-1 #6012. 44 parts in injection moulded plastic - 5 of them clear: fuselage halves, doors and the glazing nose, the rest grey. 14 parts in beautiful white metal - main rotor head and shaft, winch and winch arm, rudder pedals, etc. The instruction sheet is not very clear, especially with regard to the main and tail-rotor assemblies. The plastic parts looks rather rough on the surface and will require some preparation, but the engraved panel lines look good once the flash is removed. As with many limited-run kits, all the windows will need to be sanded and polished. Dry-fitting of the fuselage halves and the glazing nose suggests that filler will not be needed. The cockpit looks like it could probably use some additional detailing, notably on the floor and rear bulkhead. 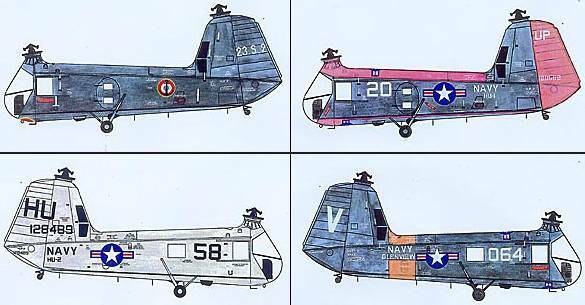 US Marines HO3S-1, MAMS 33, Japan Sea, 1950-53. French Navy WS-51 Dragonfly, Flotille 58S, aircraft carrier Arromanches, Indochina 1953-54." 3. Italeri's 1:48 USAF MH-60G Pave Hawk #2612 is definitely a new mould. In common with the imminent Merlin HM.1, this kit features folding rotor blades. The instructions indicate that it can be made with the blades either folded or extended, but it would appear from a brief examination of the parts that the hinge could be assembled without glue to leave them freely positionable. The blades are moulded with an exaggerated droop at the root end; this will need to be flattened out to give a more realistic slight droop along the length of the blade. 55th SOS in Saudi Arabia, 1991, no serial; sand, brown & dark tan camouflage with white recognition stripes. 210th Rescue Squadron, Alaska, 1990, 26207; grey, field green & European green. 4. Amodel will be releasing another version of their nice little Ka-15 Hen kit. 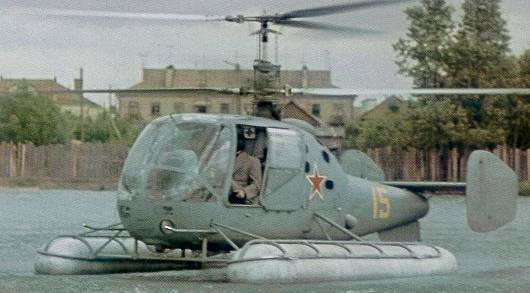 This time it will be a Ka-15MG, which I'm guessing (from analogy with the Mi-1MG) will come equipped with floats. 6. 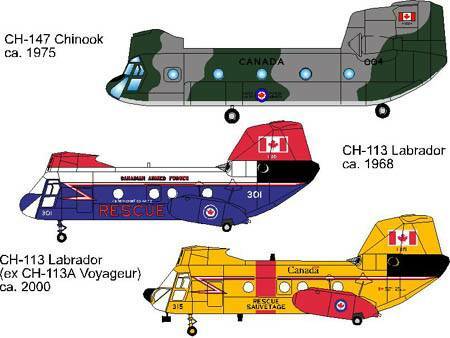 Belcher Bits new 1:72 decal sheet #BD11 provides markings for the CH-147 Chinook in any of the operational schemes in which it served from 1975-91, plus any CH-113 (Labrador and Voyageur) post-CAF unification, from about 1968 to the present. The decal sheet is 'generic' in that there are enough roundels and numbers to do any aircraft desired. 7. Aerocalcas Argentinas have released a decal sheet in 1:48 that includes a few markings for an Argentine Air Force Hughes 500, serial H-39, though most of the decals on this sheet (#4809) are for the FAA Mirage IIIC. Well folks, the demand is there and I am working the masters for detail/update parts for the Blackhawk in 1/35th scale. So many people have seen the movie "Black Hawk Down" that the differences between UH/MH aircraft are noticed. Here are a few enhancements to be coming soon: The full size Stabilator, the engine inlets with appropriate covers and engine faces, rear cabin wall fully detailed. "Velcro Hawk" set to include the FLIR and mount, radar nose and what ever cockpit differences there are. The MH-6J MELB conversion has been finished. The instruction sheets are being constructed and the release of this set should be in about two weeks. There will be follow on sets for the fast rope rig and step and the original heavy plank." 9. In February Eduard will issue #XS159, a 1:72 canopy and wheel mask set for the Fujimi KV-107II-5 Shirasagi. I see no reason why this wouldn't also be applicable to any of the other Fujimi KV-107 or H-46 kits. 10. Academy have re-issued the MRC 1:35 OH-58D Kiowa Warrior 'Thugs' kit as #2197. 4466 SH-3H, ex Hasgawa (released Oct-01, but was not in the 2001 catalogue, so they've listed it as new here). Thanks to Sergey Kirsanov (Navigator), Yevgeny Borrisov (HKN honorary translator and middle-man), Fabrice Fanton, and Chris Miller (Cobra Company).